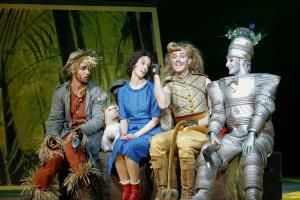 The Wizard of Oz surely must be the most magical musical ever written. Adored by adults and children alike, many will have had their first encounter with the lovable trio of the witless Scarecrow, cowardly Lion, and the Tin Man in search of a heart while watching the iconic 1939 film starring Judy Garland in the title role of Dorothy. But The Wizard of Oz was a stage musical decades before it came to Hollywood. L. Frank Baum’s fairy tale, The Wonderful Wizard of Oz, written at the turn of the twentieth century, was first produced for the stage by Fred R Hamlin. Coined as a musical extravaganza, The Wizard of Oz received its premiere at the Grand Opera House in Chicago on 16 June 1902 before transferring to the Majestic Theatre on Broadway on 21 January 1903 and subsequently going on tour across the United States. The story of The Wizard of Oz is so familiar that it barely needs re-introduction: Dorothy, a farm girl from Kansas, is whisked off by a tornado to the fantasy Land of Oz The only person who can help her to find her way back home is the wizard. But before she can seek his assistance, she first has to find her way to the Emerald City and escape the clutches of the Wicked Witch of the West and her subservient army of winged monkeys. Such is the appeal of Baum’s original story that the Oz universe has gone on to inspire a whole host of adaptations all over the world, including Charlie Smalls and William F. Brown’s The Wiz which also made it to the silver screen, starring Diana Ross as Dorothy and Michael Jackson as the Scarecrow, and most recently, Stephen Schwartz and Winnie Holzman’s Wicked: The Untold Story of the Witches of Oz, which has been playing to sellout crowds in London’s West End for more than ten years. Now it is the turn of the Volksoper Vienna to present this wonderful piece of theatre in the version which is perhaps the most faithful to Metro-Goldwyn-Mayer’s unforgettable technicolor film, created by the Royal Shakespeare Company in 1987 and featuring the famous Oscar-winning song, penned by Harold Arlen and Yip Harburg, Over The Rainbow.